Never Enough Nails: Your Thoughts on the New China Glaze Island Escape Collection? 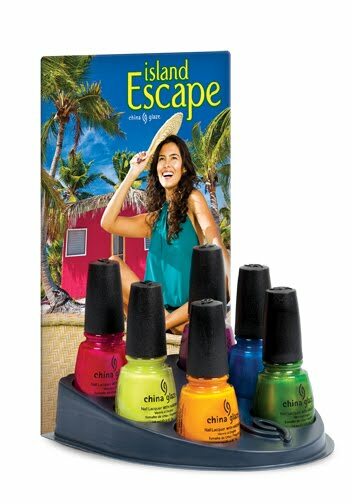 Your Thoughts on the New China Glaze Island Escape Collection? · Papaya Punch: Crème based vivid orange. · 108 Degrees: Flirtatious berry pink with specks of micro glitter. · Senorita Bonita: Passionate purple shimmer with pink micro glitter. · Blue Iguana: Bold and daring sparkly blue. · Cha Cha Cha: Vivacious shimmer green. · Electric Pineapple: High intensity crème based lime green. First thought- LOL at posting summer collection info, as it's currently snowing. Second- what is a "high intensity creme"? Interesting. I like the name Blue Iguana, so I'll probably get that. Overall, I think these are nice and bright, and it's cool that they did some shimmers and glitters that are really bright for a change. What do you think about this collection? What are your must haves? Spring Giveaway- OPI Texas, China Glaze!! Preview of the New Zoya Collections! Deal of the Week- Zoya Intimate for $25! !